“There are two main explanations for the above verse. First, according to some scholars, the word "camel" used in the verse is actually a mistranslated error that resulted from translating the word "rope" from Greek which in that day was made out of camel hair. To make matters worse, the two words in Greek at the time looked similar when written and sounded similar when spoken. The other explanation is to just read the verse literally. Some say that the verse simply uses Hebraic hyperbole to get the point across similar to Matthew 7:3 which says "Why do you look at the speck of sawdust in your brother's eye and pay no attention to the plank in your own eye?" The other theory which states that the needle's eye actually refers to a gate in the city in which a camel can go through has been discredited by many scholars and is considered to not be the meaning.” — Kody B. “People who have this mentality that violent media is the cause of mass shootings are ignorant. Millions of M rated games and R rated movie tickets are sold each year, yet, on average, overall shootings have decreased the past few years. The real blame should go to the FBI and school security gaurds who failed to stop Cruz beforehand and are partially responsible for this tragedy.” — Kody B. ...IT WASN'T WET, DAMMIT. AND THE WHOLE POINT OF THE ARTICLE IS THAT THE FIRST PILLOW SUCKED ANYWAY, SO THAT'S WHY WADDLE DEE LIKED SLEEP KIRBY'S MYPILLOW. If Waddle Dee's original pillow was fantastic, he wouldn't need a new one! So minus points for just missing that whole thing, and for FAKE NEWS, and, and, for unnecessary cursing, and for holding down the shift key for too long! YEAH. BAD COMMENT. 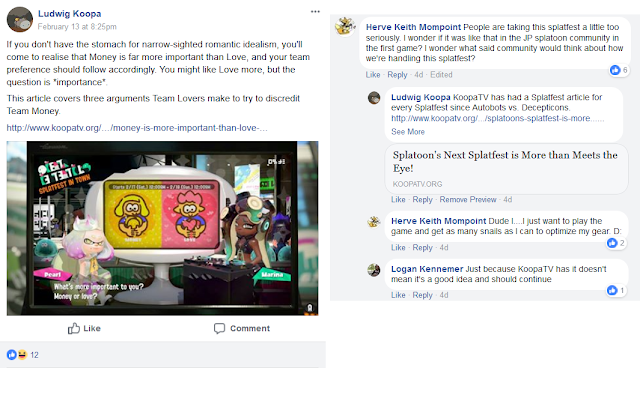 There were over a dozen comments questioning how anyone could take a Splatfest seriously enough to explore its themes, with people posting stupid .gifs and mocking the premise. KoopaTV Loyalty Rewards Program Round 18 RESULTS! Now that we know who won some late-stage points because of the previous section (Kody B. got a +6 boost and Samantha Lienhard got a +3 one), who is #1 and the winner of KoopaTV Loyalty Rewards Program Round 18, with a prize of a $10 Nintendo eShop card? Announcing KoopaTV Loyalty Rewards Program Round 19! Round 18 has ended, and therefore Round 19 has officially begun (as of the beginning of March 1)! The prize? Another $10 Nintendo eShop code. This one has the possibility of having an even weirder code component than Round 18's. Or it has the more likely possibility of being totally unintelligible. Anyway, this round ends April 29 at 23:59 Eastern. That was the only correction of February 2018, so in terms of factual accuracy, we're still doing wonderfully. KoopaTV Feedback Form and Quiz XV are now available! Just wait a little bit and you can access them here. You guys don't do them right away anyway. I just need to think of worthwhile things to actually get feedback on. In the meantime, you're free to use the comments section here. Update 3/2/2018: They're available. No more waiting. Go do them! Ludwig realises that you may get the kind of reaction from your friends that Ludwig did when he shared that article to that Facebook group, but he still wants you to share KoopaTV content regardless. It's a benefit to everyone to do so! Click here to read the January 2018 review newsletter for all the things January 2018. ...Yeah. How about the March 2018 review newsletter for all things March 2018... plus April 1? KoopaTV's February 2017 review newsletter is here. The times were darker. The times are brighter in KoopaTV's February 2019 review newsletter! I might not have won the round, but I still managed to get a free $10 eShop code thanks to a Coca-Cola and Target promotion that has now ended. It was a little bit of hassle, but it was worth it in the end. ...Yeah I tried searching "Coca-Cola and Target promotion Nintendo" and got something from 2007. It was actually 2 $5 Target e-gift cards that I earned and then used to purchase the eShop card.